It would be a sign that something had gone horribly wrong (an event in the league of my own death or city wide flood and famine) if I had not consumed my first dim sim within 48 hours of arrival in Melbourne. 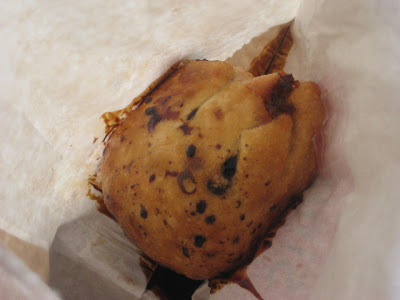 The dim sim is a unique Australian take on the Chinese dumpling. Known colloquially as the "dimmy" to proud Australians everywhere, the Aussie dim sim is about twice as big and thrice as ugly as your standard Chinese variety known elsewhere. 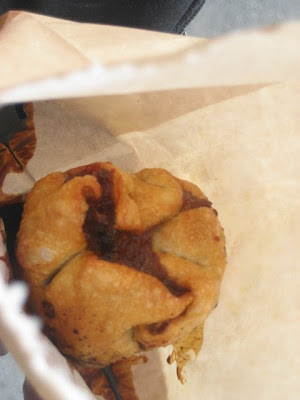 That beloved mix of pork and mystery meat, cabbage and flavourings is encased in a thick dumpling wrapper which is steamed or fried, then doused in a vigorous splash of soy sauce which must reliably leak through the brown paper bag from which it is eaten and drip lazily down your arm as you eat and walk. The dimmy is not to be eaten gracefully. 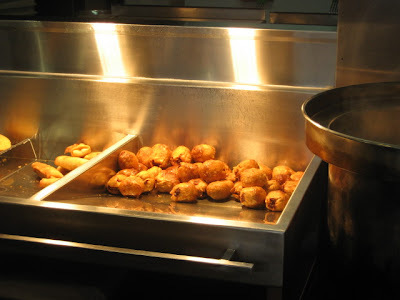 The debate over whether steamed or fried is best can divide otherwise loving friends and families. While I'm usually a steamed fan, the fried variety is an undeniably solid hangover companion. Neither option is to be eaten on a train, in confined spaces or before a hot date - beware the post dimmy breath. The elephant man of the dim sum world, it is fair to say the dimmy's blistered skin and lumpy innards have an appeal which is confined largely to the local palate. The same can be said of other national icons, like Vegemite (our yeast extract spread, a more bitter twin to the beloved British Marmite) - although unlike Vegemite, the monopoly on the production of this enduring national treasure is not foreign owned. Chinese food has long been a part of the Australian culture - and for many years it was the only commonly consumed Asian food in Australia, which would often compete with fish and chips for the Friday night take away slot. Chinese food in Australia has now evolved well beyond its traditionally "dumbed down for the Westerners" approach, and many excellent Chinese restaurants thrive in Australia - such as the Flower Drum which has won awards as Melbourne's best restaurant and is no stranger to lists of the world's top restaurants. But there remains a firmly entrenched place for the simple, street food style dim sim. So who do we have to thank for the humble dimmy? Legend has it that the dim sim was originally developed in 1945 by William Wing Young (father of Elizabeth Chong, a prominent Melbourne food writer and educator on Chinese cuisine) for his Chinese restaurant in Melbourne, Wing Lee. The thick skin was chosen for safely transporting the dimmy to football matches where they would compete directly with another Australian culinary hero, the Four 'n Twenty pie. 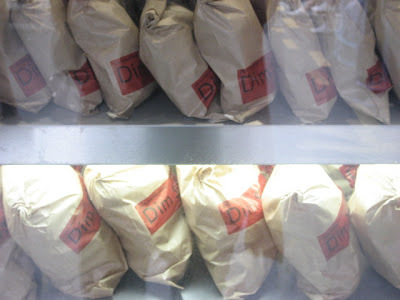 While they are available at fish and chip shops everywhere, it is often unanimously agreed that the best dimmys are sold at the South Melbourne market. However, the original stall holder died in 2006, and some say the new larger, rounder versions are not as good. 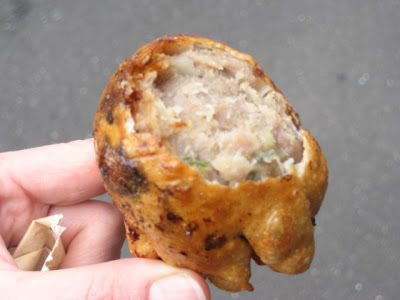 Well, after a dim sim-less 8 months, let's just say those passing me on that Sth Melbourne corner a few days ago were left in no doubt that an enthusiastic reunion was taking place. I believe the words "get a room" were contributed from passing motorists. Yes, I love the dimmy. And I have the soy stained hands to prove it. That sounds like the most fabulous hot street food! I'd be all over a fried one! That sounds pretty odd - but good... A 2010 London food trend, maybe? Another reason to move to Oz...Chinese food! Thanks Su-Lin, Hels, T, Lizzie and Kitchen Butterfly for your comments. Funny, I never realised these were a strictly local "delicacy" until I had my first craving for them overseas which could never be satisfied. Lizzie, let's bring them in to London I say. Loves food, eats lots, rants about it. Expect shameless gluttony, gastronomic travel tips and special comments from The Peanut Gallery (the Greedy Diva's boyfriend). What Mattress is Best for a Computer Worker? © 2009-2010 Greedy Diva. All rights reserved.